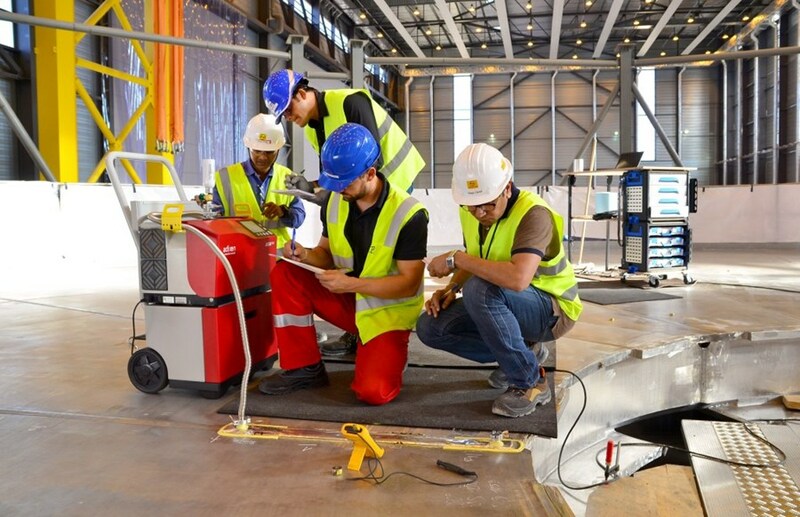 In a 6,000-square-metre workshop on site, the Indian Domestic Agency is assembling the cryostat—a huge vacuum containment vessel that is also the single largest component of the ITER machine. On the perfectly polished circular surface of the lower base section, welders have given way to specialists in leak detection. Mitul Patel, of ITER India, and Larsen & Toubro representatives Diplen Shah and Nayan Desai act as ''witnesses'' to the leak-test operation performed by Stephan Brunnbauer of the German contractor MAN. The red box to the right hosts the pump and mass spectrometer that would detect any helium atoms trapped into the ''vacuum box'' after having worked their way through the weld. The first welding activities began in September 2016 on the cryostat base (tier 1). Today, on the perfectly polished circular surface of the lower base section, welders have given way to specialists in leak detection. Their role is crucial: once assembled, the 8,500 m³ vacuum chamber must be absolutely leak tight. The challenge is considerable and begins with the quality of the welds. Every millimetre of vacuum-facing weld joints must be leak-tested before commissioning. In tier 1 of the cryostat base alone, over 100 metres of weld must be tested. The process—although simple in its principle—is meticulous to implement. If there's a crack in a weld crossing the vacuum boundary, no matter how small, it's a problem. And to detect it, something equally as small must be employed. "We use helium to detect cracks, which is as safe as it is inert¹ and whose atoms are among the smallest² of the periodic table," explains Liam Worth of the ITER Vacuum Section. "Helium atoms also have a have low viscosity—they are 'slippery.'" 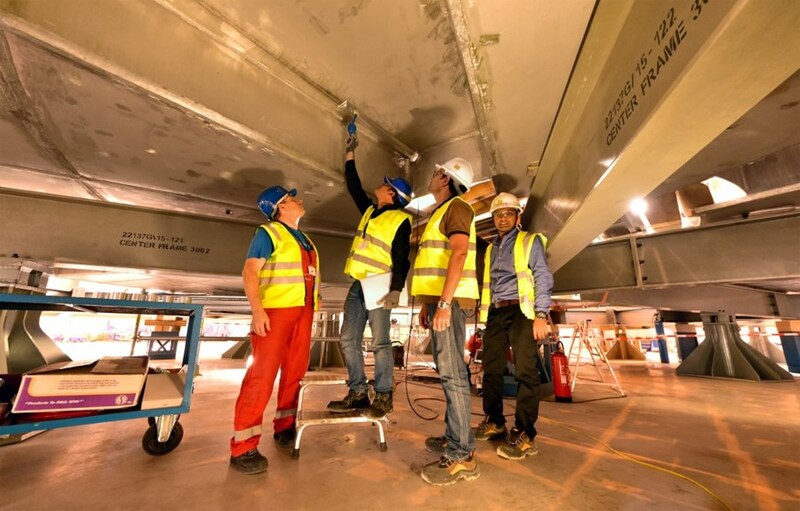 Procedures for leak testing of the cryostat welds were prepared by Larsen & Toubro Ltd, the Indian company that manufactures the component; they were submitted to and validated by ITER-India and the ITER Organization and are being implemented by Larsen & Toubro's German contractor MAN. Acting as "witnesses," representatives of ITER India and Larsen & Toubro are present at every stage of the process. Helium is injected into a box positioned on the underside of the component, which looks a lot like the one on the surface. In order to cover all welds, the operation is repeated every metre with several centimetres of overlap. The helium leak testing method utilized consists of creating a "vacuum box" to cover the surface of the weld under test. In a similar fashion a "helium box" is created directly underneath, on the opposite side of the weld. These thin, one-metre long boxes are made of aluminium foil and sealed with vacuum-compatible tacky tape. Once air has been evacuated from the vacuum box, helium is injected under pressure into the helium box below. If there is a crack the tiny, light and "slippery" atoms will work their way through the defect to end up in the vacuum box on the steel plate's surface. And because the upper box is connected to a highly sensitive mass spectrometer, any helium atom that has passed through the weld into the vacuum box will be detected. In order to cover all welds, the operation will be repeated every metre with several centimetres of overlap. Finding a leak would be a "major issue" ... but also a fixable one. "Using the same leak detection technique, but with a much shorter box, we would first need to pinpoint the leak's location," explains Liam. "Repair would then consist of grinding out the faulty weld all the way through the steel plate, then re-welding and testing." 1-The hydrogen atom is smaller but hydrogen gas is explosive. 2-The atomic radius of helium is about three million times smaller than that of a human hair.